Ask the Experts: When is the Best Time to Visit New York? Our Experts are back for another week to give their travel advice to another, slightly perplexed, blog reader. This week’s question is sent in by Gordon and it’s all about New York, New York. What can our Experts help you with Gordon? When would you say is the best time of the year to visit New York and why? Gordon, The Scottish Highlands. We’ll if it helps, I don’t think there’s ever a bad time to visit New York! But, let’s see when our Experts suggest that the Big Apple really shines. New York has a magical feel at Christmas time. Lucy Bolton from STA Travel Leeds Vicar Lane says…. I have been to New York in both summer and winter and both were amazing trips. However, I really feel that New York has a magical feel to it in the winter. The city gets really hot and humid in summer time and although it is great to chill out in Central Park with a picnic it can get quite tiring fitting in all the sights in such heat. In the winter everyone really goes all out with the Christmas decorations and Christmas spirit. All of the ice skating rinks are set up around the city so you can show off your skills – or make a fool of yourself like me! My favourite place was the rink in central park as you are surrounded by greenery and trees but then look up and see the amazing New York skyline, it is like two totally different worlds. Try out your ice skating skills in Central Park. Don’t forget to get your hop-on hop-off sightseeing bus pass – without a doubt the best way to get around New York stopping at all the hotspots, you also get a tour guide on each bus to show you around the city American style. My top tip – go to the top of the Rockerfella Centre instead of the Empire State as you get an amazing view of the city which will include the Empire State Building. I would try and visit New York for one of the big celebrations such as New Year or 4th July, but if I had to pick one it would be for Thanksgiving for something a bit different. 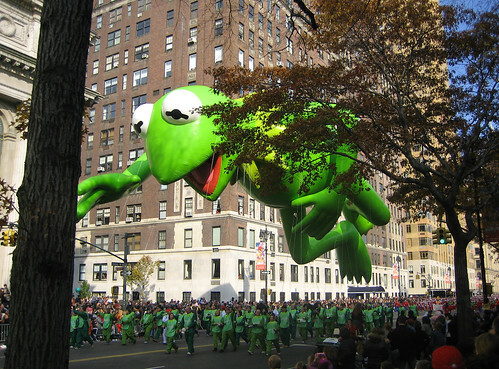 Whether it is Friends or Frasier, The Simpson or Family Guy, every iconic USA show has an episode dedicated to how much the Americans LOVE a Thanksgiving parade, so it has to be one of the best times to visit New York. Get in the festive mood as you wrap up warm and head to the New York streets to watch the giant balloons, marching bands and floats pass in famous Macy’s Thanksgiving Parade! Thanksgiving is the fourth Thursday in November so make sure you get there a few days before so you have time to take a cruise around the Statue of Liberty, climb the Empire State Building and go ice skating in Central Park – how many more iconic New York activities could you do in one trip! Start spreading the news, they’ve done it again! Great work Experts! If New York is on your travel wishlist make sure you cheak out our cheap flights and our huge selection of activities to keep you busy in the big city. If you have a travel question that you’d like some Expert advice on send us an email, and we’ll put it to them very soon!